I'm an introvert. Very much an introvert, actually. And this month has been absolutely exhausting for an introvert like me. Just in case you don't know what an introvert is, let me give you a quick run down. Contrary to popular opinion, introversion is not the same as being shy, not the same as not liking people, and is not the same as being selfish or self-centered(all common, but false, assumptions about introverts.) Introversion means that a person that's an introvert will be drained of energy when interacting with other people, and will be re-energized by spending time alone, or with one or two other people. (For me, since I'm a strong introvert, spending time with one or two other people doesn't really cut it in the re-energizing department. I need regular time by myself to feel like myself.) Extroverts are the opposite- they gain energy by spending time with others. Many introverts like spending time with other people, they'll just need an adequate time alone afterwards to recharge. Many introverts are friendly and outgoing, and in a social setting act similar to extroverts, they'll just need some time by themselves to process later. A big part of an introvert's life is inside their own head, and they need time to develop and care for that world. Does that make sense? So. I need lots of alone time to process and just "be". This past month? Hasn't been happening. First was Hayden's birthday. Then with the church's anniversary service, Thad was pretty much gone and out working all day, every day for two or three weeks straight(and he was out of town and completely gone for three of those days). He was working hard, but so was I, taking care of the kids and the house completely on my own. The anniversary service itself was amazing, but that was an ENTIRE day of interacting with people- totally exhausting for me, on top of already being exhausted. Whew. Then add on the regular Sunday and Wednesday services, on top of other various meetings and interactions with church members, etc. The weekend after the anniversary service we had a wedding to attend, so that was another long night of interaction. I know that there are a lot of you out there that have a lot more on your plate, and I'm not trying to complain, just explain where I'm at right now. Just as I was starting to recover from all that and feel normal again, my aunt and uncle came into town. I love my aunt and uncle. I LOVE spending time with them. But it was not an ideal time for my introverted self to have company. I apologized for not being as energetic and fun as I usually am when they visit, but I just didn't have a lot left to offer! They were gracious enough to understand, and my aunt arranged for us to get some one on one time together. For me, it's not the same as alone time, but still a lot more helpful than being around 5 or 6 people at a time- plus I really enjoy spending time with my aunt. They left yesterday afternoon, and I don't think I've ever been more excited to have the house to myself! It wasn't that I was happy for them to leave, I was just so happy to be by myself(well, plus the kids) for the first time in what felt like forever. I felt a tiny bit more refreshed when I finally dragged myself to bed last night, and thought maybe I'd be good now. Oh no. I didn't realize just how bad things had gotten until after church this morning. I normally feel a bit drained after 3 or 4 hours of interacting with people every Sunday, but today I was just exhausted and even felt a bit panicky just after church got over. I could not wait to get out of that door and just get away from everyone! Then it dawned on me. I've been running on fumes for three weeks now. My level of interaction compared to my needed alone time has been grossly out of balance the past month, which means that my tolerance for interaction with other people is extremely low right now. I'm in serious need of recharging! So this week is self care week. I'm focusing on me this week. Tomorrow Thad will watch the kids for three or four hours so that I can have some alone time. Maybe that will be enough to catch me back up, but if it's not, I'm going to take every opportunity that I can this week to recharge. The kids might watch a little more tv than usual. I might not get as much housework done. But that's ok. I'm scared to find out what might happen if I don't take care of myself and get the rest and rejuvenation that I need. I can't be the mom and wife that my family needs if I'm burned out and not feeling like myself. So this week, I'm putting myself at the top of the priority list. And tonight? 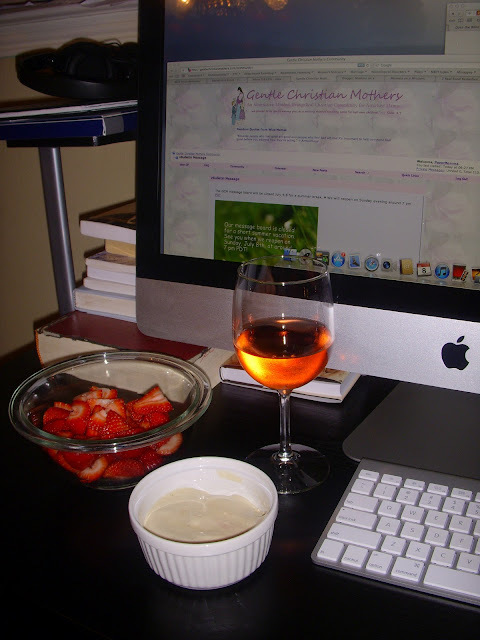 I'm getting the kids to bed, and then settling in with a glass of wine, a bowl of strawberries(and GAPS icing to dip them in), and some GCM. It's been offline for four days now for a summer break, and I can't wait to dive right back in.